This project contributes to the field of curriculum integration and the role of the arts within integrated learning contexts. In particular, it scrutinised integrated inquiries that incorporated drama and visual art with other learning areas. It also examined ways in which children, teachers, and the wider community engaged in arts based integration. Most of the international practices in this field fall into the “good idea” category rather than being based on research. This project helps to address this knowledge gap. Aitken, V., (2012, June). The drama put them up there and they wanted to remain Paper presented at A Child’s World Conference: University of Aberystwyth, Wales. Aitken, V., (2012, July). “When you’ve been doing it as long as I have...” Repositioning children through role-based strategies in classroom research. Paper presented at IDEIRI 7 (International Drama in Education Research Institute) Conference, University of Limerick, Ireland. Aitken, V. (2011, April) Everything links to everything really doesn't it? : Drama and learning in Mantle of the Expert. Paper presented at Drama NZ conference, St Kentigern College, Auckland. (Published in proceedings of the conference). Aitken, V. (2011, April). Let's talk about Mantle - a workshop for teachers presented at Drama NZ conference, St Kentigern College, Auckland. Aitken, V. (2011, April). Mantle of the Expert (MOTE), Dramatic-based inquiry learning: a cross-curricular approach to teaching and learning. Paper presented at the IFTE conference Much Ado about English, University of Auckland, Auckland. Aitken, V. (2011, December). Connecting curriculum, connecting learning: Findings from a two year study into negotiated curriculum through Mantle of the Expert and other arts-based integration. Invited address to the Critical Studies in Drama Symposium, University of Auckland, Auckland. Deane, P. (2011, July). Making art the start. Paper presented at the Aotearoa NZ Association of Arts Educators’ Conference, Hamilton. Deane, P. (2011, February). Making a difference: students as agents of change. Paper presented at the Learning@school conference, Rotorua. Deane, P. (2011, October). Making a difference; Students empowered by social agency. Paper presented at the ULearn conference, Rotorua. Deane, P. (2011, October). Making art the start. Paper presented at the ULearn conference, Rotorua. Fraser, D. (2011, August). Connecting curriculum; Connecting Learning. Invited address to the Making Connections School Leaders’ Conference, Hamilton. Fraser, D. (2011, February). Issues in visual research. Paper presented at the University of Waikato Colloquium on visual research, Hamilton. Fraser, D. (2011, November). Researching integration and the arts. Keynote address to the Performing and Inquiring Conference, Massey University, Wellington. Fraser, D. (2011, November). Student engagement; Details from classroom research. Paper presented at the NZARE annual conference, Windermere, Tauranga. Fraser, D. (2011, October). The connecting curriculum, connecting learning project. 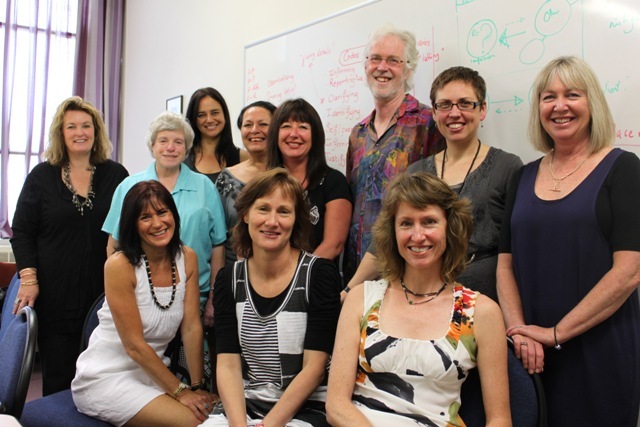 Edline: News from the Faculty of Education, The University of Waikato, 3. Gilbert, G., & Townsend, L. (2011, February). Pieces of mantle. Paper presented at the Learning@school conference, Rotorua. Price, G. (2011, July). Connecting curriculum: possibilities and challenges within arts based integration. Paper presented at the Aotearoa NZ Association of Arts Educators’ Conference, Hamilton. Price, G. (2011, November). Curriculum connections glimpsed before dawn. Paper presented at the NZARE annual conference, Windermere, Tauranga. Price, G. (2011, October). As dimensões profissionais do Arte educador: ensinar e produzir arte (Arts education for misfortune; Voices Lost and found). Invited Address to VIII Seminário do Ensino de Arte: desafios e possibilidades contemporaneas, Goiânia, Brasil. [Translation by Prof Albano]. Tauranga, W., Knapper, C., & Parkes, M. (2011, February). Collaboration, engagement, negotiation and the arts. A journey of discovery through mantle of the expert. Paper presented at the Learning@school conference, Rotorua. Whyte, B. (2011, May). Connecting curriculum, Connecting learning project: Interactive Group Activity – A possible classroom assessment tool? Paper presented at the Tauranga Curriculum Integration Practitioners’ Support Group, Windermere, The University of Waikato at Tauranga. Whyte, B. (2011, November). Learning’s smack dab in the middle: Mining children’s perspectives on their learning. Paper presented at the NZARE annual conference, Windermere, Tauranga. Fraser, D., & Deane, P. (2010). Making a difference: Agents of change through curriculum integration. Set: Research Information for Teachers (3), 10–14. Aitken, V. (2010). Mantle of the expert; Positioning children as competent co-constructors for meaning. Paper presented at the Making a difference symposium; an extended conversation about learning, the University of Waikato, November 2010. Aitken, V. (2010, November). Mantle of the expert; Positioning children as competent co-constructors of meaning. Paper presented at the Making a difference symposium; an extended conversation about learning, University of Waikato, Hamilton. Aitken, V. (2010, October). ‘It’s like everything links to everything really’. Drama as research tool in Connecting Curriculum, Curriculum Learning. Paper presented at Critical Studies in Drama in Education International Symposium, Auckland University, Auckland. Aitken, V., & Pirini, E. (2010, April). Connecting curriculum: connecting learning - a case study. Paper presented at Branching Out: Drama NZ conference, Napier, New Zealand. Aitken, V., & Pirini, E. (2010). Connecting curriculum: connecting learning - a case study. Paper presented at Branching Out: Drama NZ conference, Napier, New Zealand, April 2010. Deane, P. (2010). Social conscience and the politics of help; the complexity of an aid project. Paper presented at the University of Waikato, Faculty of Education, Colloquia series, October 2010. Deane, P. (2010, August). Social action. Presentation at the Connections 2 Cluster, Southwell school, Hamilton. Deane, P. (2010, October). Social conscience and the politics of help; the complexity of an aid project. Paper presented at the University of Waikato, Faculty of Education, Colloquia series. Fraser, D. (2010). Connecting curriculum, connecting learning; featuring the arts. Paper presented at the University of Michigan Colloquia series, October 2010. Fraser, D. (2010, November). Engagement and integrated curriculum. Paper presented at the Making a Difference in Classrooms and Centres: The Intersection of Theory and Practice Symposium, University of Waikato, Hamilton. Fraser, D. (2010, October). Connecting curriculum, connecting learning; featuring the arts. Paper presented at the University of Michigan Colloquia series, Ann Arbor, USA. Fraser, D., & Whyte, B. (2010, May). A collaborative research project on the arts and integration. Seminar presented to the University of Waikato at Tauranga and Bay of Plenty staff, Windermere Campus, Tauranga. Fraser, D., & Deane, P. (2010). Making a difference: Agents of change through curriculum integration. Set: Research Information for Teachers, 3, 10-14. Fraser, D., & Whyte, B. (2010). A collaborative research project on the arts and integration. Seminar presented to the University of Waikato, Windermere Campus, Tauranga, May 2010. Fraser, D., Aitken, V., Price, G., & Whyte, B. (in press). Inquiry learning, drama and curriculum integration. Set: Research Information for Teachers. Fraser, D., Whyte, B., Aitken, V., & Price/Gilbert, G. (2010, November/December). Connecting curriculum, connecting learning; Negotiation and the arts. Symposium presented at the Australian Association for Research in Education conference, University of Melbourne, Melbourne. Fraser, D., Aitken, V, Price, G., & Whyte, B. with Deane, P., Keys, N., & Pirini, E. (2010, March). Rebuilding from disasters: Stories of hope through arts-based integration. Presentation to the Tauranga Curriculum Integration Practitioners’ Group, Windermere, The University of Waikato at Tauranga. Fraser, D., Whyte, B., Aitken, V., & Price/Gilbert, G. (2010). Connecting curriculum, connecting learning; Negotiation and the arts. Symposium presented at the Australian Association for Research in Education conference, University of Melbourne, 28 November - 2 December 2010. Fraser, D., Aitken, V., & Whyte, B. (under review). Connecting curriculum, connecting learning. Wellington: NZCER. Price, G. (2010). Interrogating the use of the visual; A visual arts perspective. Paper presented at the Wilf Malcolm Institute of Educational Research (WMIER) Research Colloquia, October 2010. Price, G. (2010, August). Minding the gap: Examining the quality of teacher interaction in the arts classroom. Keynote presentation to 2nd International seminar on Aesthetic Education, Sao Paulo, Brazil. Price, G. (2010, October). Interrogating the use of the visual; A visual arts perspective. Paper presented at the WMIER Research Colloquia, University of Waikato, Hamilton. Tauranga, W. (2010). Integration and the arts; one teacher’s journey. Teacher workshop for he University Musical Society, Michigan, USA, October 2010.